If you are in need of tooth restoration, one of the most preferred dental options is a crown. The crown is placed on top of a tooth that has been filed down, to give the damaged tooth to restore the tooth’s functionality so that you can achieve a strong, beautiful smile that will last for years. Crowns are highly durable and long-lasting, and they are made with realistic-looking materials that allow them to blend seamlessly into the rest of your smile. Dental crowns are small prosthetic teeth, or caps, that are permanently placed over a tooth to help restore its strength and improve the appearance of the tooth. A dental crown is commonly used to protect weaker teeth from further decay, or from breaking. Being used to help cover and support a tooth where there is not a lot of tooth left from receiving a large filling. To hold a dental prosthetic in place such a dental bridge. To give support to a decayed and weakened tooth from further damage or breaking. At Ascent Dental, porcelain is the preferred material of choice for crowns because of its beauty and durability. Porcelain crowns are specifically sculpted to function like the natural tooth, giving the tooth strength and resilience. They are designed to blend into the rest of your teeth, while still maintaining the durability of a natural tooth. Porcelain crowns allow for the tooth to withstand the normal forces that come from biting and chewing, however it is important to remember that crowns are not indestructible and need to be properly maintained. 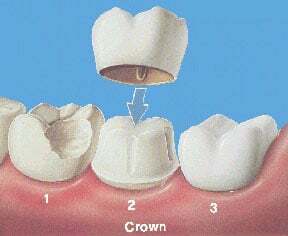 What is the procedure of getting a Dental Crown? First prepare the tooth by smoothing and cleaning the area. All decay will be removed, and the tooth will be smoothed down to create enough room for the crown to go on. Next 3-D renderings, or impressions will be made of your teeth. This allows for the crown to fit perfectly in place once it has been created. A fabricated permanent crown will be created based off your dental impressions or 3-D renderings. This may be created in-office for you. The fabrication will be based off 3-D digital impressions of your mouth to perfectly match the rest of your teeth, and your crown will look and feel like your natural teeth. Because we value your time, Ascent Dental Group can create your dental crowns for our patients in the same day. We use the highest and latest technology so that we can create a dental crown for you in one visit. A dental crown can help restore beauty to your smile. A dental crown looks and functions as if they were your natural tooth. A dental crown can last for many years with proper dental hygiene and care. We use the latest technology, called a CEREC machine which allows us to create beautiful, and durable crowns for you right here in our office, usually in less than an hour. A small camera is used to take 3-D images of your teeth. With the help of this machine and our computers we can create crowns that look as if they were your natural tooth, in addition to being extremely durable. You can walk out of our office with a gorgeous new smile! If you would like to inquire more about a dental crown, contact Ascent Dental Group today and one of our helpful staff members will be happy to assist you!